Discussion in 'General Martial Arts Talk' started by TSDTexan, Feb 7, 2019. Wow! I'm impressed he used the SAME leg for the hiza! Quick! been racking my brain for months. cant think of one. and in Doshinkan... ashi barrai are in a lot of kata where typically you dont find them in other traditions. He didnt have to go far. The guys face is accelerating up to freefall speed. Gravity makes you move faster. Ive seen this, excellent timing! It looks like the guy who got swept was going in for a hard punch and was in the process of loading his front leg. The timing of the sweep was perfect, not requiring a lot of effort. He did an impressive slide back to get in position and add strength to the knee. Gravity and the force started by the white guy moving in created a lot of the force from the knee. Timing is a beautiful thing. Naihanchi/Tekki kata shows the "sweep step", also called the "returning wave kick" in some styles. 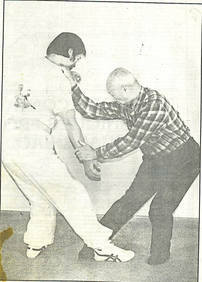 It is also used as the counter to a kick or attempted foot sweep to yourself. I'm going to say neither, unless it is something he specifically trained as part of a system. Many styles have a front sweep and a knee. When people talk about the value of stance training and being rooted. This is a good example of why you need solid stances. Some fighters have the ability to read your stance and will be able to tell if you are light on your feet or if you are solid. Motobu ryu says its a front kick. a front kick and a knee strike use same principles. Well the poor guy advanced 3 times in a straight line directly at him. Very easy to read. It's probably another benefit of lifting the knee to kick in the event some unlucky person decides to fall on it. yeah he did and even had a nice rhythm to it. 1 point contact foot sweep requires good timing. 2 points neck wiping foot sweep require less timing. If you can put your hand on your opponent's neck, there are many throws that you can apply from there. - sweep his leading leg from inside out. This clip uses inside out block to set it up. Since this require your opponent to punch you first, I don't like to train this way. I don't like my technique has to depend on my opponent's punch. it could be neither as you say. or it coud be karate. Hiza geri and ashi barrai are both kihon waza. pretty basic level technique stuff. You learn it low kyu. The only karate schools where I havent seen it... is poorly educated mcdojo operation... where the instructor has a shallow grasp due to an incomplete transmission. These were Shotokan style (as in when asked about their lineage they quoted Shotokan people) but they didnt call themselves shotokan schools... and i definitely have seen it in other better educated Shotokan schools. Plus.. its is all over the hundreds of karate reference materials. It was Lyoto Machida bread and butter when he was doing point fighting. This is him doing it as a blackbelt... who has had a few years to dial in this kihon. This is good timing. His opponent is all over the place. That's the more common sweep using the back leg (foot). The front foot isn't as common unless you are holding onto someone. Say a clinch. The front sweep is faster and the power to drive it is different and more difficult. It's a high level of timing required. I can do it, but I miss more often than not. But if you can time the foot before it lands then it's worth all previous misses. From what I've seen sweep in general is difficult. Those who learn it definitely maximize the use of it. yeah... i like this idea. dont let him have a punch. It needs to land just after they have shifted their body weight forward onto the lead leg, but before their foot has settled. A lot of MA have not learned about moving the center / transferring weight until the foot has settled. They lift the foot too high. This is an exploitable weakness in the young artist. the mature artist has been told, and has learned how to move without compromising structure. The beginner kata Sanchin, or Nihanchi both are tied to this principle. If you have mastered either of these kata, then your not going to easily be swept by ashi barrai. To be swept after that requires active efforts to off balance. there is an old Okinawan expression that is claimed to have originated in China. in English it comes across as follows. "The boy that cannot walk stumbles much, the man that keeps his feet also keeps his head"
"The boy that cannot walk stumbles easily, the man that keeps his feet also keeps his head"
1. shine bite - downward force. 2. scoop - horizontal force. 3. sticky straight up lift - vertical upward force. 4. sticky 45 degree upward lift - 45 degree upward force. 5. foot sweep - 45 degree upward force. In other words, before you learn how to sweep, you will need to learn how to set up and bite your foot on your opponent's leg.